The surface of the conjunctiva and of the cornea is not completely smooth but it shows many undulations, termed micro-projections. These are membrane bound cytoplasmic protrusions that extend for a small distance of about 0,5 to 1 micrometer outwards. Some of the micro-projections resemble finger-like structures and they are called microvilli whereas others have more the shape of folds and are termed microplicae. The multitude of micro-projections results in a vast enlargement of the surface area and thus of the water-binding capacity that the cell membrane exerts by their attached mucins - see below. Micro-projections of the epithelial cells of the human ocular surface (here the conjunctiva) occur in form of finger-like microvilli and fold-like microplicae. The cell membrane that surrounds them has numerous integrated long glycoproteins (colored her in pink) that radiate into the surrounding aqueous surface milieu. The glycocalyx has a high water binding capacity and maintains the wettability of the epithelial cell surface. The micro-projections are covered by a fuzzy coat that is termed GYCOCALYX. It consists of membrane-bound glycoproteins - polysaccharide sugars linked to a central protein backbone. They project from the cell membrane into the surface compartment, which is typically aqueous and forms the bottom of the TEAR FILM. I VIEW THROUGH the TEAR FILM. The Microvilli of the epithelial cell surface with their integrated mucins can bind the water of the tears and thus make the ocular surface wettable. Free secreted mucins (faint pink lines) from the goblet cells of the conjunctiva mix with the tear water and transform it into a water-mucin-gel that forms most of the tear film thickness. A very narrow surface layer covers the aqueous phase lid a lid on a pot of warm water. It and retards the evaporation of water and thus improves the stability of the tear film. at the Ocular Epithelial Surface composed of the membrane bound glycocalyx (here: green) and the secreted Goblet Cell mucins (here: red). The mucin barrier prevents adherence of microbes to the cell surface. The mucin barrier has bound protective anti-microbial molecules such as the specific defense molecule Immunoglobulin A (IgA) and molecules of the non-specific innate defense systems, so called anti-microbial peptides and proteins (AMP). Together with transforms the mucin barrier into a relative in-penetrable barrier for microbes and contributes to the surprisingly low rate of infection ... in view of the fact the the ocular surface represents a moist chamber, that is almost always directly exposed to the environment. Such a membrane-bound GLYCOCALYX can perform different functions either for specific BINDING, as receptors for cell recognition. One well known example are membane-bound polysaccharides on blood cells that determine the blood groups. Due to its high hydrophilic water binding capacity, the ocular glycocylyx is very suitable for the binding of water. Another function is the formation of a mucus BARRIER that is intended to block binding of other structures, particularly of microbes. The mucin layer is a chemical barrrier and one of the main protective barriers of the ocular surface epithelium and it belongs to the non-specific, innate, defense systems. The rose peddles we see here would be considered to be "wet" by most of us because they are coverered by by water drops all over... but the are in fact not ´wetted´in the strict sense, i.e. not the complete surface is covered by water but the water is restricted to individual drops whereas most of the surface is not covered by water ... and thus remains ´dry´. So, when it comes to fine structure and molecular dimensions the issues of being ´wet´ or ´wetted´ or ´dry´ become more tricky than our conventional wisdom would assume. But ... that is the reason why we have invented ´Science´... and this is not just sophistic theory as you may notice when you develop a dry eye. 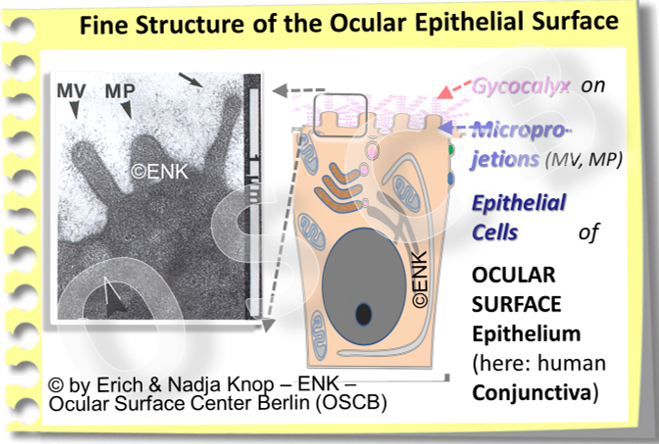 On the ocular surface epithelium the glycocalyx consists of particularly large molecules with certain structural features that are termed as MUCINS. They are so large that they can be observed in electron microscopy as a fuzzy cell coat of about 100 nm thickness in the human (see images at top of this page). The mucins radiate into the overlying tear fluid and can thus bind large amounts of water to the cell surface of the ocular surface epithelium. In early research on the ocular surface it was reported by Frank HOLLY and Mike LEMP that the ocular surface appeared to be naturally ´un-wettable´ by aqueous solutions - but could be made ´wettable´ by (re-) addition of mucins. `Wettablity and Wetting´ was thus a big issue in the early days of systematic ocular surface and tear film research in the 1970s. By the ´trick´of nature, to use water-binding surface molecules, the ocular surface can bind and hold the aqueous tear solution, that is needed here for functional reasons, on the surface. Question that will concern us later are ... how the the aqueous tear fluid gets to the front of the cornea before it can be bound there... and how long it stays there. These questions are answered in the section for ´Tears and Tear Film´ - for details please see there. It may be surprising that the surfaces of the cornea and the conjunctiva, that glide over each other during every eye blink, are not completely flat and smooth. Conventional wisdom would probably suggest that a smooth surface produces the least amount of friction during eye movements during reading and particularly during the frequent blink movements when the upper eyelid wipes over the bulbar surface. Apparently, such a slightly ´rough´ surface results in a lowering of friction as explained elsewhere (Heiko PULT).